Those of you who have spend some time in a biology lab have probably had to see a frog or two dissected in front of your eyes. Not everyone is a fan of frog-dissection days. Thanks to Frog Dissection app for iPad, you can now check out what’s inside the body of a frog without actually cutting a live frog open. Frog Dissection is a great educational tool that can help you a ton about dissecting a frog without you actually having to do it. 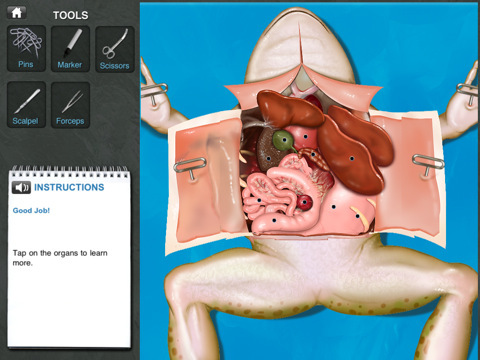 You will have all the tools you would need to dissect a frog (except everything is virtual). 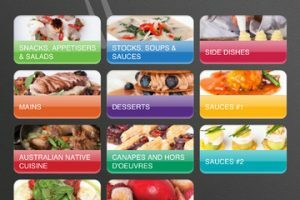 The app does provide you with step by step instructions and 3D views to offer you a more realistic experience. Frog Dissection offers you 3D images of the frog’s anatomy, giving you a better understanding of how everything comes together inside a frog. 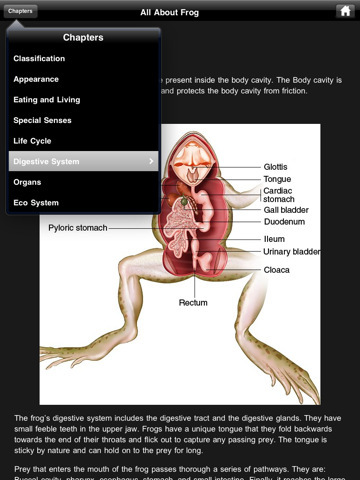 It has a ton of useful information on frog’s organs, life cycle, systems, senses, and other related topics. Frog Dissection is one unique educational tool that can teach you a whole lot about frogs and their systems. It saves you the trouble of having to cut a real frog open (too often). What’s not to like?